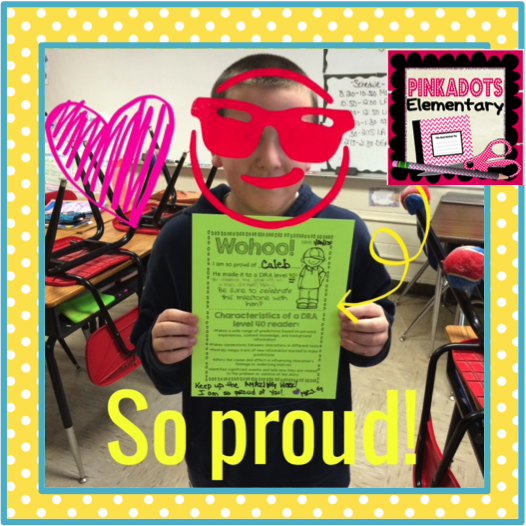 Pinkadots Elementary : Spark Student Motivation Saturday! DRA Reading Certificates! Spark Student Motivation Saturday! DRA Reading Certificates! 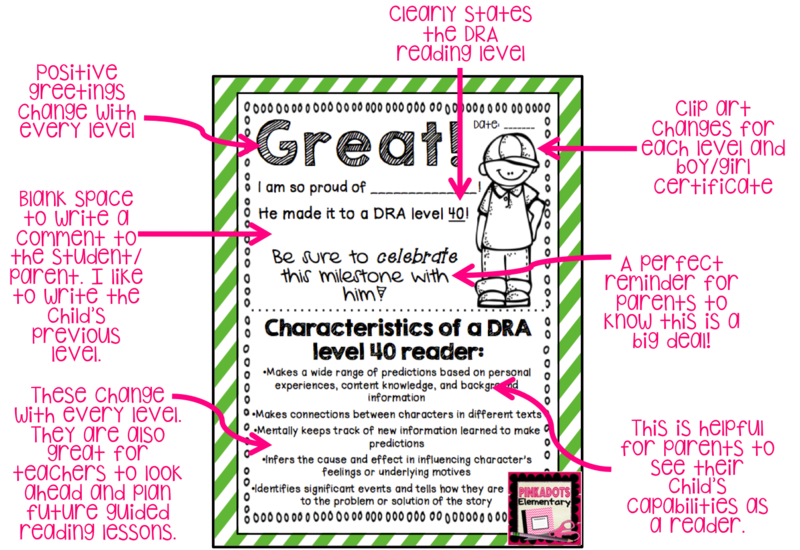 For the past few years Robyn and I always sent a note home with parents to let them know their child's DRA score. We test for reading scores in the fall, winter, and spring, so the levels are constantly moving. When sending a note or email home to parents, we did learn that they needed more information than just a number. We created these adorable certificates and not only did we love them, but the students and parents did too! I finally had the time to bundle them together and make them TPT worthy, so check them out here! Since I am showing off these beauties, I wanted to link up with my BBB, Joanne, for her Spark Student Motivation linky! We've been giving these out in class and making a huge deal for the students when they receive the awards. Joanne is the queen of motivation and taught me the power of flickering the lights on and off in a previous post. So I tried it and BAM...eyes lit up, ohhs and ahhs were heard all around, and loud claps and cheers filled the room. Could that be any more motivating for a student? What is even better, are the emails from parents telling me how excited their child was to show them the certificate. The parents are always thankful for the update and for knowing their child's capabilities as a reader. This B&W (printer friendly) bundle covers all DRA levels from 2-70. I also made the certificates specific for boys and girls. The clip art is adorable, and copied on colored paper they look awesome! I know they motivate my students and believe it or not the helpful information included at the bottom motivates parents to spend more time reading with their children to see and test out the strategies. Love these! Cute and motivational and also informative. Headed to check them out right now!